Back at the beginning of the Fall TV season I previewed four new shows that were about to hit our screens. Early into the season I wrote that I’d sadly had to abandon my efforts to watch two of the shows, Gotham and Selfie. A number of people have told me that Gotham has improved and its popularity certainly seems to be increasing as the season progresses. I’m glad for the actors involved; as I mentioned in both previous articles I’m a fan of the majority of the cast. However, I still do not feel compelled to watch. Selfie has not been picked up and its run finished with the mid-season break. I fell a little bit in love with Grant Gustin as Barry Allen during his appearance on Arrow so I had a feeling I would enjoy the series and I have not been disappointed. Gustin brings us a bubbly and well-loved Barry; someone who, despite his tardiness and general clumsy ways, is efficient and mostly respected at his day job and adored as his alter-ego. In early episodes I had some concerns about the emotionally charged scenes with Barry’s father as they shed many tears while talking at each other through a prison screen. Not that these scenes weren’t well performed; John Wesley Shipp as the older Allen gives an understated performance, Gustin cries better than most people and their chemistry is great. I started to feel a slightly “soapy” edge to the scenes though. I’m happy to see their interactions have become slightly less teary with a nice gentle injection of humor. One of the things the show needed to be careful with was Barry’s lovable nature becoming one-dimensional. After the explosive crossover episode arc with Arrow where Oliver Queen (Stephen Amell) told Barry he could be so much better than the Arrow because he didn’t kill my concerns grew. What I have seen lately, though, is a focus on Barry’s arrogance regarding his abilities and this played a role in the gripping mid-season finale. It gives Barry a flaw and fits with his youth and excitable nature. The Flash has a large ensemble cast so character development has been slow for some. Danielle Panabaker as Caitlin and Carlos Valdes as Cisco are really starting to become well-rounded, especially with the appearance of Caitlin’s previously assumed dead fiancé, Ronnie/Firestorm (Robbie Amell). Caitlin is struggling to maintain her professional stiff-upper-lip scientist façade and Cisco is barely containing the guilt he feels for leaving Ronnie behind. Their vulnerability surrounding Ronnie was just beginning to show as the hiatus hit and I’m looking forward to that building. Jesse L Martin as Joe, Barry’s surrogate father, is consistently great, showing his tender side when dealing with either Barry or his biological child, Iris. He also excels as a cop and has some great comedic moments as he attempts to cover for Barry’s alter-ego. I like Iris, she’s well portrayed by Candice Patton, but I’ll admit to being a little confused by her divided affections. After the first episode I was convinced I would not like her boyfriend and Joe’s partner, Eddie, but he has been written as sweet and attentive and I find myself rooting for him. Meanwhile, Iris is having secret rooftop meetings with her crush, The Flash as well as feigning ignorance of Barry’s affections until his Christmas confession, at which point she proceeded to make goo-goo eyes at him. See? Confusing. Through all of this is Tom Cavanagh’s great performance as Dr. Wells. Without our ability to see his nefarious actions once Star Labs is empty I think he would have fooled us all. Since we, as viewers, first saw him leave his wheelchair and enter his intriguing secret room we’ve been waiting for the other shoe to drop on his true identity but I honestly can’t say I expected the reveal we were given in the mid-season finale. Kudos to the show runners for that gem and huge props to Cavanagh for such a bang-on execution of Wells’ duplicitous nature. Overall I’ve thoroughly enjoyed the first half of this inaugural season, particularly the outstanding stunt and VFX work. Sometimes the writing can be a little clunky and they will need to be careful to give the attention due each member of the cast. But I’m happy to give The Flash a solid A- and look forward to what seems to be gearing up for an exciting second half! US political shows are always hit and miss with me because I was such a huge fan of The West Wing. 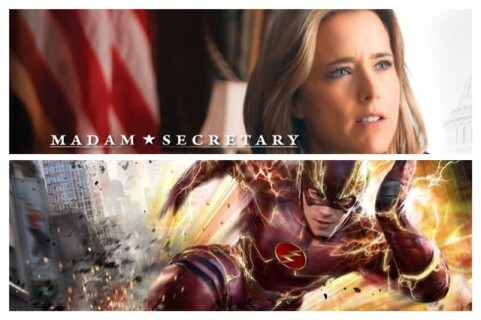 While I was excited about the drama starring Tea Leoni as new Secretary of State Elizabeth McCord, it was with some concern that Madam Secretary would have nothing new to offer. The show quickly plunged us into a conspiracy theory as the events surrounding McCord’s predecessor were surrounded in suspicion. As the season has progressed the conspiracy has deepened and the beloved former Secretary’s integrity has been called into question, causing fallout both politically and privately for McCord as her CIA contacts try to investigate and find themselves in peril. The possible involvement of her White House colleagues, including Chief of Staff Russell Jackson (brilliantly and menacingly portrayed by Zeljko Ivanek) forces her to trust few people and towards the end of the first half of the season we start to discover just who it is she can turn to in her time of need. While attempting to uncover the truth she also has to attend to the matters of state for which she has been appointed and in her inexperience she employs unorthodox methods, often successfully. Her CIA background has seen her in situations that a politician would ordinarily avoid and we, as viewers need to suspend our disbelief somewhat when she uses her covert knowledge to essentially blackmail foreign powers. McCord is supported by loyal and efficient staff, however their loyalties initially lay with her predecessor and it has taken some time, and frankly, her willingness to show vulnerability for them to recognize that she is worthy of their respect. As with The Flash this is a large ensemble cast but their stories gel well enough that I feel we were afforded the opportunity to get to know them fairly well early on. McCord’s assistant, Blake, is wonderfully brought to life by Erich Bergen and his cutting sarcasm and long-suffering attitude is one of my favorite aspects of the show. The aspect of Madam Secretary that makes it differ from The West Wing is the focus on McCord’s home life. Her marriage to Henry (Tim Daly) is coming under increasing strain as the confidential nature of her work affects them all. Henry is also, almost inexplicably, once again consulting with the NSA, exacerbating the issues, and their children are starting to learn things about their parents that they are finding difficult to accept. The McCord’s home life is where it becomes a little too angst-ridden sometimes. The chemistry between Leoni and Daly is great and their moments of domestic bliss in early episodes were a nice break from the intense political drama. Now that Henry has returned to the NSA even their light-hearted relationship has become strained. There is definitely an aspect of fantasy about Madam Secretary and I often find myself questioning her actions, as opposed to the more realistic feel of The West Wing. I also think the writers will need to take care to keep the premise as advertised. As the conspiracy thickens it is interesting but has few places to go once it is solved and McCord’s character becomes increasingly questionable. Having said that I greatly enjoy Leoni’s portrayal and the clever dialogue along with a stellar cast allow me to give Madam Secretary a B+. What about you? What do you think of these shows? Which new shows this year have blown you away or made you cringe? As always, we’d love to hear from you!